These are the ultimate in luxe stretch denim in a skinny fit. With a medium rinse, they are darker than our 39″ Distressed Skinny and lighter than our 38″ Dark Denim Skinny Yoga Jean. 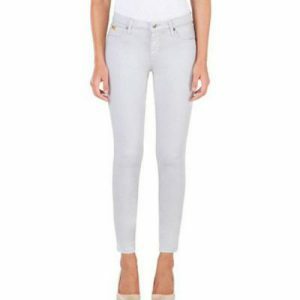 Get the perfect fit with this revolutionary stretch denim that will hug and flatter your curves in all the right ways. The Yoga Jean diagonal stretch and “memory fit” material will not stretch out, even with multiple wears and over time. Tags: 38 inseam jean, extra long jean, high rise jean for tall women, long jeans, mid rise jean for tall women, stretch jean for tall women, tall jeans for women, tall skinny jean, tall yoga jean, women's tall pants, yoga jean.